Fall is prime vacation time for those who love “leaf-peeping,” and Biltmore offers the best of the Blue Ridge Mountains, all in one convenient location. 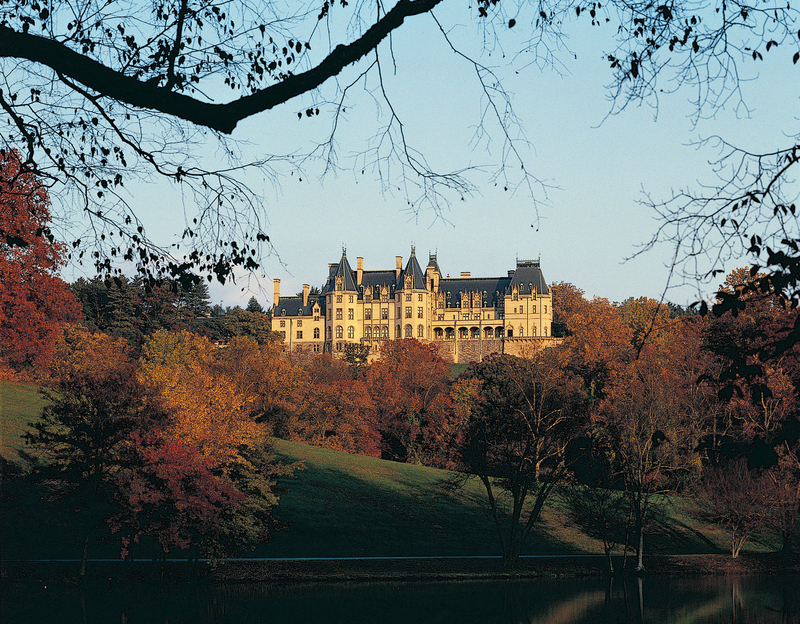 Biltmore’s setting makes it the perfect choice to be the center of your mountain getaway. 1. September is North Carolina Wine Month. Celebrate with a Vine to Wine Tour. What better way to spend an afternoon than learning about North Carolina’s wine scene? Start by visiting areas on the estate not normally seen by guests, including a trip to the vineyards, a walking production tour, and a wine tasting. 2. You can experience the estate and the Blue Ridge Mountains on a horseback ride. Enjoy a ride on autumn trails through the woodlands and meadows of the estate while experiencing the beautiful backdrop of the Blue Ridge Mountains. You can even take a private lunch trail ride, with a stop on your ride for a picnic. 3. Horseback riding not your style? Cozy up on a horse-drawn Carriage Ride. Horse-drawn carriage rides offer another way to experience the surrounding scenery of the Blue Ridge Mountains. Biltmore’s Trail Barn offers daily private and group carriage rides through the estate’s forests and rolling pastures. 4. Join in the Halloween spirit! Whether you planned to visit a pumpkin patch or stay put at the estate, we’ve got you covered. Join the pumpkin carving contest at The Inn on Biltmore Estate—the winner receives a two-night stay next year on the same weekend—followed by a pumpkin lighting ceremony on The Inn’s Grand Terrace. 5. Asheville is a great please to find live music, and so is Biltmore. On Friday and Saturday evenings, check out Biltmore’s Live After Five in Antler Hill Village with live music, the Grape Stomp, and cookout food favorites. Families can also enjoy the nearby farm, where kids can visit the friendly barnyard animals. 6. Biltmore is located close to downtown Asheville and the Blue Ridge Parkway. Downtown Asheville is less than a 10-minute drive away—and you can even leave the driving up to us! On Friday and Saturday evenings, Biltmore offers a shuttle service for lodging guests with various stops downtown. 7. Attend a culinary event special to North Carolina. September is Taste of Biltmore, celebrating the harvest season with multiple culinary events. Check out a Moveable Feast for a chance to enjoy an evening of memorable cuisine, with a backdrop of the Blue Ridge Mountains and the western façade of Biltmore House. 8. Use Biltmore as your center of relaxation. Wind down your adventurous visit to Asheville with a seasonal treatment at The Spa, such as a full body massage featuring Appalachian-inspired aromatherapy. Or shop at Biltmore’s own Bookbinder’s for a great new read and head to the gardens, The Lobby or the South Terrace for a backdrop of spectacular views. These are just a few reasons among many that make Biltmore such a great home base. See for yourself: Book a stay at The Inn on Biltmore Estate or Village Hotel to discover your own ideas.